Enjoy purified water straight from your kitchen tap with The Grohe Blue Mono Pure Starter Kit. 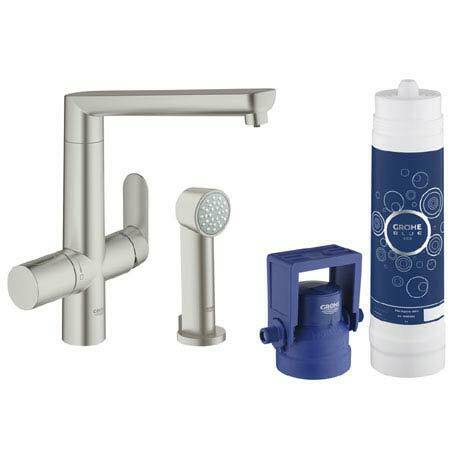 The kit comprises of a Blue K7 Mono tap, a filter which removes lime and chlorine giving you fresh tasting table water and a side spray for maximum flexibility in your kitchen. Its high swivel spout allows you to fill tall pots and jugs with ease while its SuperSteel finish, gives it a mat stainless steel look that will be an elegant highlight in your kitchen.